I like to make my HSTs two-at-a-time. The easy formula to remember is add 7/8″ to your FINISHED block size. If you are working with 2.5″ squares, they finish at 2″, so the HST needs to start with 2-7/8″ squares. Draw a diagonal line on the back of your fabric and sew 1/4″ from the line. When you cut on the line, you will have 2 HST, quick and easy. I have also noticed, as I have been working with stash for the last few weeks, I have tons of “dot” fabrics! I gravitate towards tone on tone prints these days because I find them the most versatile in my scrappy type of quilt design. Circles show up a lot! So in a recent buying spree (hey, everything was 50%, what is a quilter to do?!?) I made sure to find other patterns. Tula Pink had some great prints such as “Hummingbird” and “Arrowheads” and I even found a stripe that would look pretty with the blocks pictured above. Vicki is hosting a Quilt Along. She dyes beautiful fabric and is offering prizes each week. 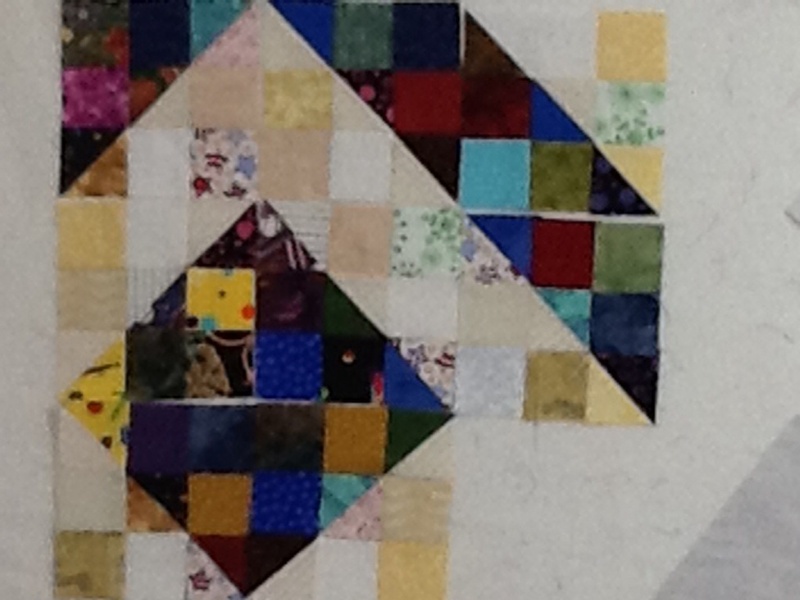 Pick any block that uses half square triangles (HST) and join the fun! 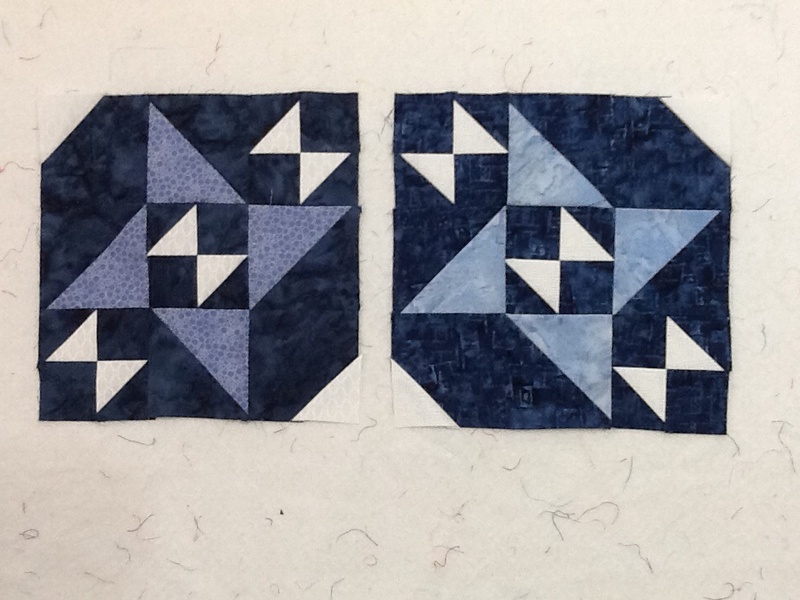 I am using Split Nine Patch blocks as a leader-ender project (more info at Bonnie’s blog), and there are three HSTs per block. As an added bonus, the blocks form HSTs too! Here are the baskets with my squares. The small one holds the 2.5″ squares. I use the two-at-a-time method to make HST, so I cut my squares at 2-7/8″, then sew 1/4″ from each side of a center diagonal, thencut on the line. 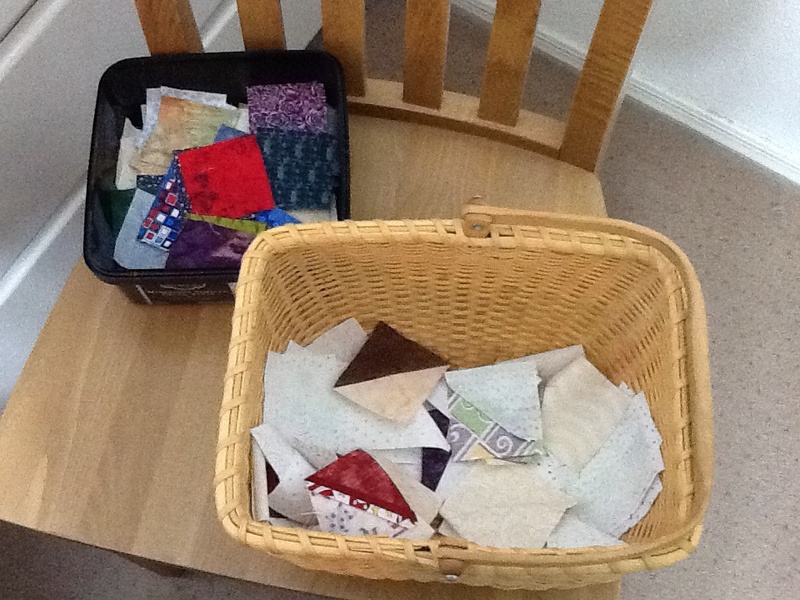 The bigger basket has those larger squares and the finished HST. I usually lay out one block next to my machine and then I am ready to grab a piece when I get to a stopping point in my main project. 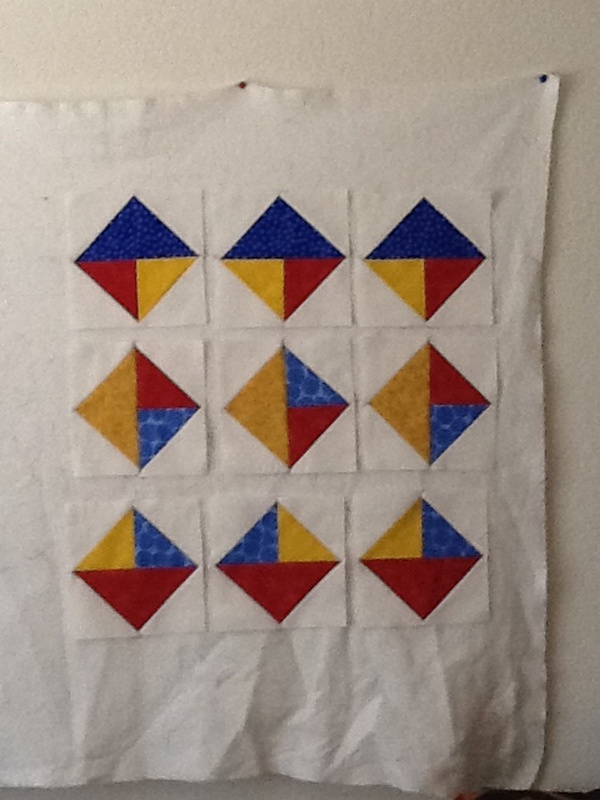 Here is the finished Split Nine Patch block/larger HST: These blocks can be arranged in many, many, many ways. Vicki has been sharing different layouts. Earlier in the year, I started with a single square, then rows of light and dark. 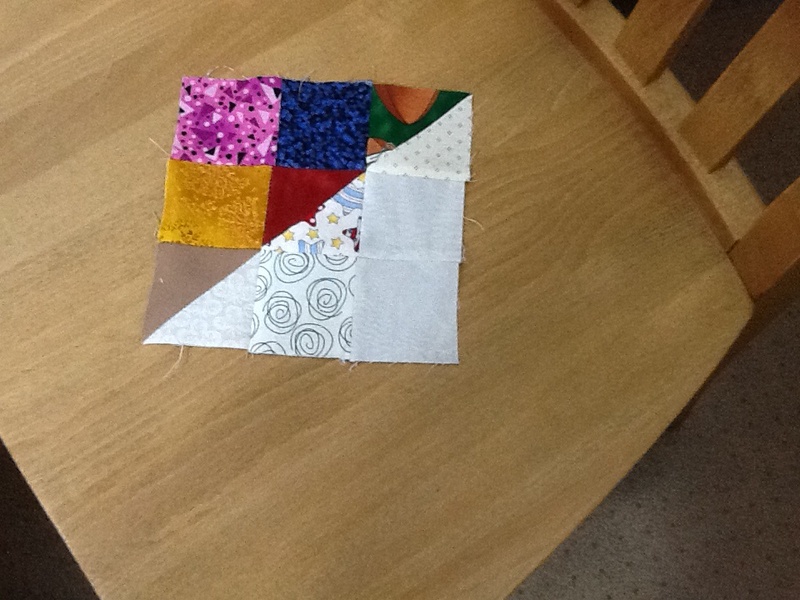 This morning I used alternating squares. I have 21 blocks that finish at 6″, so I figure I need about 120 blocks for a 10×12 layout. That will end up at 60×72 without borders, which will fit the QOV required dimensions. I started pinning piles of blocks together in packets of 10. It is fun to watch the pile grow! Okay, I have to confess a minor bout of “start-it is.”I have never been a monogamous crafter…I have dozens of projects laying about, so I have plenty to choose from when I get time to hide away in the sewing room. But, it is getting a bit overwhelming to have four quilts in rotation. I may have to put something in time out just to make space on the table! First up are some grey and white Drunkard’s Path blocks for a secret project. I was intimidated by sewing curves, but my mom told me the trick is to keep the arch of white fabric puffed up, with just the seam allowance flat along the curved arc of the grey fabric. And that is working beautifully, yay! My second project is bead blocks for the February Block Lotto group. I made three in the yellow-orange-maroon colors for the exchange, then made these in patriotic colors for the Mod Mod QAL that Sophie is hosting this year. 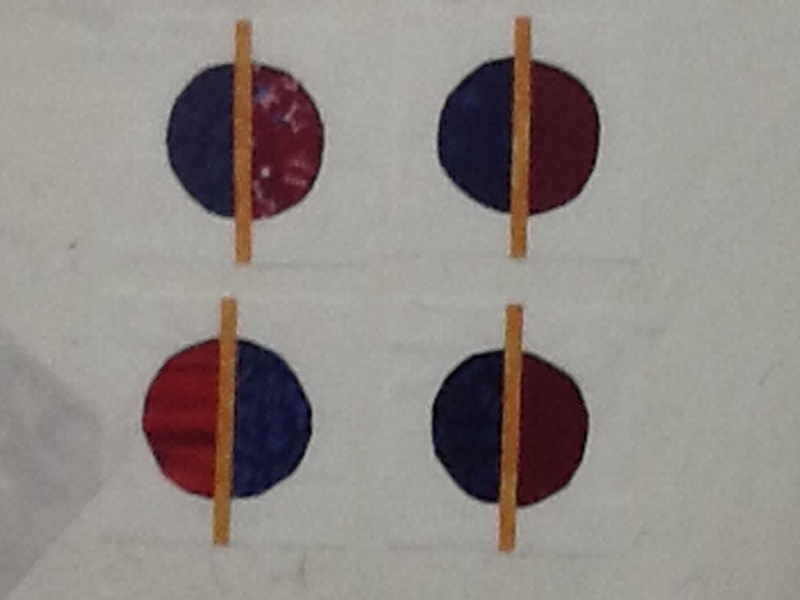 I need to go back and finish the January chevrons…I need 4 of those for a twin size quilt, and 10 of the beads. I have my basket of squares ready and when I get to the end of chain piecing for a different project, I reach for one of these blocks. 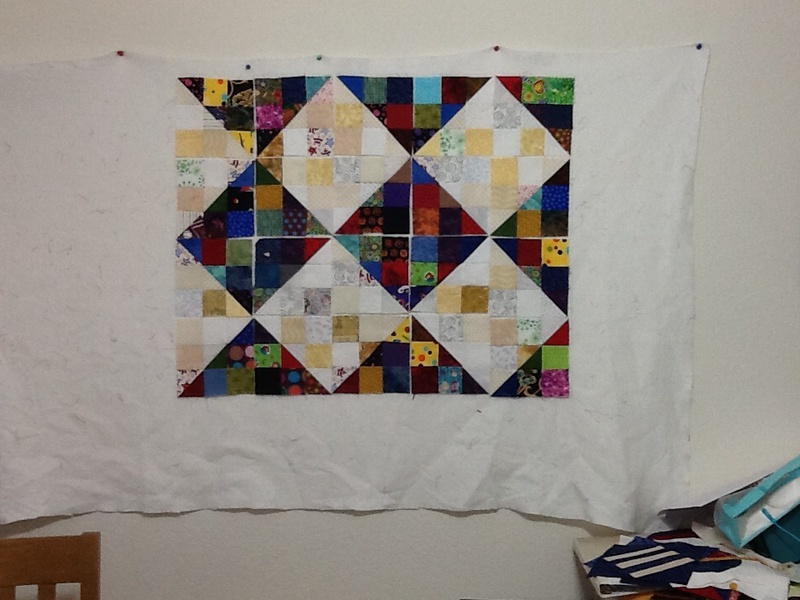 I am using 2-1/2″ squares, so these blocks finish at 6 inches. I will need at least 120 bl0cks to make it QOV size. I will be satisfied if I have enough for a top by the end of the year! And some progress on the Star Light Star Bright QAL: Flying Geese on the left and 1/4th of the required half square triangles on the right. 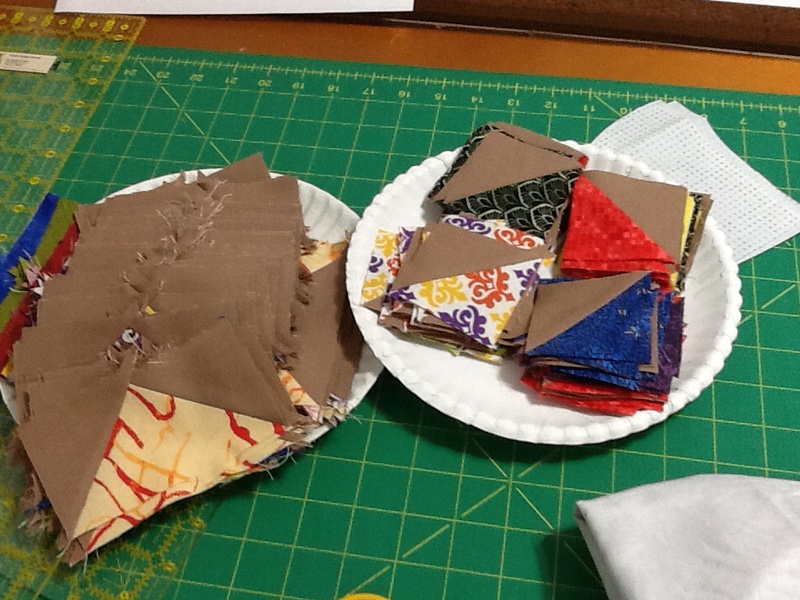 Last week’s assignment was over 300 HSTs!! There was no way I could get that done. I haven’t even peeked at this week’s directions, but I think we have enough units to make a whole star block. I decided to swap out one fabric. The “Mardi Gras” colors in the top piece were not playing well with my other fabrics. Each star will have two main colors and an accent plus the background which is that tan fabric shown above. Yes, I cut all the pieces, and paired the groups of three for the star blocks, then decided it just wasn’t working, so I found that tonal purple in my stash. 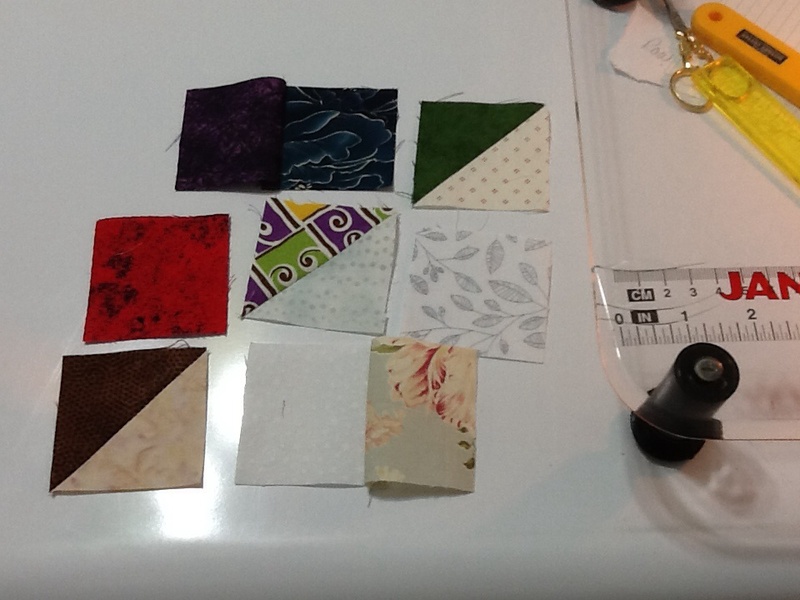 I cut the purple squares to make HSTs, then as needed I will replace the other sections.